About Us — MATRIXVISA INC. The owner/director, Cobus (Jacobus) Kriek, also regularly publishes immigration law articles in Canada's immigration law magazine called, ImmQuest. You can also view these articles here. On 27 Oct 2010 Cobus also appeared as a witness before the Parliamentary Standing Committee on Citizenship and Immigration in Ottawa about changes to the Immigration and Refugee Protection Act. His presentation to the committee can be seen here. The owner and director of Matrixvisa Inc. became a member of the ICCRC after successful completion of a post graduate course in immigration law in Canada, along with the successful completion of the entry examination for immigration law. Compliance Audit Regulation provides the rules of annual audits of members of the ICCRC. COMMISSIONER OF OATHS - Certificate Number 174215. Cobus is also a Commissioner of Oaths in the Province of Quebec in terms of the Courts of Justice Act of Quebec, with worldwide validity. ALBERTA LICENSE - License Number 321239. Matrixvisa holds licensure as a Recruiter in the Province of Alberta. It is compulsory in Alberta to have a License in terms of the Alberta Fair Trading Act and the associated Alberta Regulation 189/99: Employment Agency Business Licensing Regulation. Regulation 10 of the Alberta Employment Agency Licensing Regulations require that an agreement must be signed by a foreign national and Matrixvisa Inc. before a job offer is obtained. This agreement must contain in bold font size 12, the statement that payment from the foreign national for finding an employer/job offer is prohibited. Regulation 12 stipulates that a foreign national may not pay Matrixvisa Inc. for a job offer or for a search to obtain employment (relevant Alberta Regulations). SASKATCHEWAN LICENSE - License Number 000208. Matrixvisa holds licensure as an Immigration Consultant and Foreign Worker Recruiter in the Province of Saskatchewan. It is compulsory in Saskatchewan to have these Licenses in terms of the The Foreign Worker Recruitment and Immigration Services Act. Matrixvisa holds licensure as a Recruiter in the Province of British Columbia. 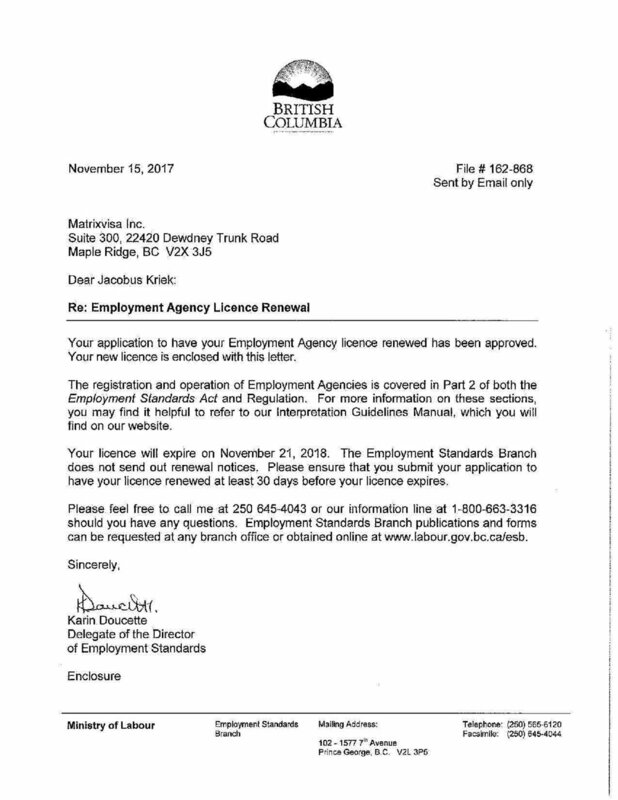 It is compulsory in British Columbia to have a License in terms of the Ministry of Labour in BC Employment Standards Regulation Part 2, 3 and 4: Employment Agencies. The Director and owner of Matrixvisa Inc., Cobus (Jacobus) Kriek, completed a postgraduate course in Canadian Immigration Law. After graduating from university in both labour economics and industrial psychology (personnel management), the Director of Matrixvisa Inc also completed a postgraduate qualification in International Trade Law. We have offices in Toronto, Calgary, Vancouver and Johannesburg. We have a strong footprint in South Africa and Canada. Matrixvisa Inc. is a specialist international recruitment and immigration law company under one roof. We can help immigrants to emigrate and find them work or show them to navigate the labour market effectively. Please read the 22 reasons why skilled workers can not find work here. We have an in-house ability to represent clients from specific countries and specific industries through a complicated legal process that includes Employment and Social Development Canada (ESDC), Immigration, Refugees and Citizenship Canada (IRCC), as well different regulatory bodies in different provinces. A good example of our work in regulated occupations can be seen at point 13 here. Matrixvisa Inc. has an brilliant track record for service excellence. Matrixvisa Inc. gives every case individual attention, and makes a careful analyses of every case. Our clients know that their success is important to us.